We’re pleased to offer this event which replaces the previous Pricing, Capital and Reserving seminars. Technical Issues in General Insurance (TIGI) is a two-day event, including a half-day programme on IFRS17, as well as 1.5 days of plenaries and workshops focussed on key technical issues in each of pricing, capital modelling and reserving areas of general insurance. Bethan Faultless – a consultant for Willis Towers Watson working in the UK P&C team having been the Technical Pricing Manager for Markerstudy Group before that. She has an in-depth knowledge of all areas of insurance pricing with a more recent focus on using emerging machine learning techniques to solve practical insurance problems. Matthew Lambert – a member of Willis Towers Watson’s pricing team with practical experience of using machine learning in a wide variety of use cases such as augmenting risk models and designing strategic segments for insurers to target. Renaud Million is the co-founder and CEO of SPIXII, an award-winning InsurTech company dedicated to helping more people get better protected through automated technology. Passionate about transforming the insurance industry, the move to start SPIXII was a natural fit. Renaud was named Young actuarial professional of the year 2017 by Insurance ERM. 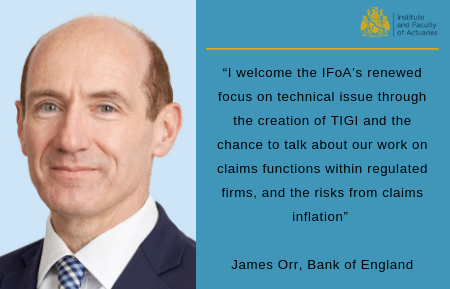 James Orr – Chief Actuary for General Insurance at the Prudential Regulation Authority, part of the Bank of England Group. He is also the Head of Department for the General Insurance Risk Specialists within the PRA. His career has included working for Lloyd’s of London, time as a GI consultant, and five years with the PRA’s predecessor organisation, the Financial Services Authority. The newly formed General Insurance Lifelong Learning (GILL) Committee are busy preparing the General Insurance (GI) Continuing Professional Development (CPD) programme for 2019. The call for speakers for CIGI will close on 3 May and GIRO/ potential webinar topics will now close on 31 May 2019. All submissions will be considered independently by the GILL Committee and we will get back to you shortly after the deadline. When submitting your proposal, please state the event you would prefer to speak at. Plenary session Thu, 25/04/2019 - 09:00 - 10:00 IFRS17: What should I be thinking about? An overview of the roadmap to IFRS17. What should we all be doing now and where are implementation projects struggling. What is driving these and how might we start to think about the solutions. A presentation designed for those who have limited knowledge of IFRS17. This workshop will cover the basics of implementation timeline, General Measurement Model and Premium Allocation Approach, Risk Adjustments and Onerous Contracts. This workshop will be a facilitated group discussion of how companies may approach and develop practical approaches to some of the more complex and technical areas of IFRS17. This session will major on onerous contract testing and minor on premium allocation approach and coverage units. This workshop will be a facilitated group discussion of how companies may approach and develop practical approaches to some of the more complex and technical areas of IFRS17. This session will focus on: identifying premium allocation approach eligibility, coverage units and onerous contract testing. A presentation summarising the hot topics within the standard including PAA eligibility, identifying portfolios and groups of business, approach to reinsurance, risk adjustment and onerous contract testing. This workshop will be a facilitated group discussion of how companies may approach and develop practical approaches to some of the more complex and technical areas of IFRS17. This session will focus on: calculating a risk adjustment and outwards reinsurance approaches. In recent years we have seen a rapid expansion of the use of machine learning and AI technologies, with their use now “business as usual” across many pricing and reserving teams. However, as experience with these technologies continues to grow, the impact to the industry is likely to become much wider. In this talk Andy Rigby will begin by presenting a number of more advanced applications of machine learning, with a particular focus on these wider areas and how the deployment of these technologies might represent substantial changes to the risks and opportunities faced by the industry in the coming years. With the rise of digital capabilities, consumers expect to do a lot with their mobile or desktop, from ordering an item to transferring money. Insurance services are not escaping these expectations. Immediacy is even more important and waiting on the phone is a terrible experience for customers especially when emotions are evolved such as when making a claim. Due to the complex nature of insurance, personal experience is required to make these digital capabilities and service immediate, effective and relevant. Insurance chatbots coupled specific applications seem to be the right candidates to deliver on these expectations. As chatbots and the services they perform give rise to an unprecedented amount of data, the use of machine learning is crucial to make sense of the data and derive actionable insights. 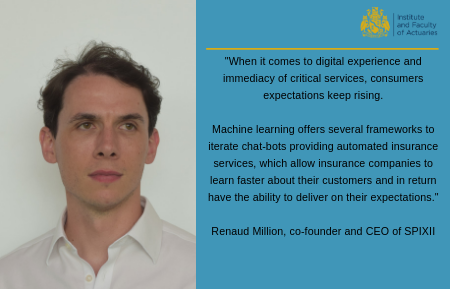 In this talk, Renaud will cover the most recent findings and real examples derived from the experience SPIXII gained since 2016 in developing automated insurance services using chatbots as a conversation interface. Tenth iteration of the Institute and Faculty of Actuaries Third Party Working Party (TPWP) for Private Car Comprehensive experience. Scope expanded to include analysis of own damage experience. Analysis includes trends in frequency, severity and burning cost for third party bodily injury claims (split by claim size); total third party property damage; and total own damage claims compared and contrasted with environmental and legislative changes. Rate Monitoring usually involves using a single rate change figure to convey the whole message (eg rates have increased by 2% for class of business X over the past year). By presenting this information as a scatter graph there is a lot more information that can be conveyed. This is can be revealing for the class of business. It is also a useful discussion point with underwriters for portfolio management over a year, with some potentially counter-intuitive results. The starting point for the presentation is the standard Lloyd's rate monitoring - including claims inflation. This has implications for pricing as well as reserving and business planning. The term “machine learning” covers a range of methods that can be powerful, with very practical benefits, in pricing and other insurance applications. Such methods can aid in further improving GLM results or more broadly bring valuable insights to complex problems. There can also be a number of practical challenges in using these methods effectively. This session will review a range of commonly used methods and illustrate different ways that they are being applied in insurance, including some case study results. The PPO Working Party presents the most recent results from its Qualitative Survey. Various Insurers and Re-insurers have contributed by answering a variety of questions revolving around the reserving for, pricing of and capital needs associated with PPOs. As users and spectators of models, we will take the audience on the pricing journey from fixed prices, through rate books and GLMs to machine learning. With a focus on implementation of models and impact to the end customer, we will identify and discuss some of the benefits and pitfalls of each chapter in pricing sophistication. With increasing scrutiny of GI pricing practice from a range of observers continuing to make this a hot topic, the presenters will role play real world man vs. machine examples to bring our views and wider perspectives to life. If you are considering motor pricing factors or pricing motor factories then this session will inform and provoke. Level: No prior knowledge required. The pros and cons from a customer perspective of each chapter of the modelling journey. Key points to consider when making changes to your model. How to balance continued evolution of pricing sophistication and real customer outcomes. This talk joins accounting and capital concepts to develop a different viewpoint on some classic questions. In particular thinking about the cost of capital rather than capital, and using appropriate accounting techniques, leads to clearer thinking about capital matters. You can’t have data science without data. Though insurance pricing has not yet exhausted the analysis possible on current data, new alternative data is becoming increasingly talked about. This plenary discusses the world of alternative data and how it can affect insurance pricing. Aimed at demystifying the stochastic reserving process, this talk outlines the basics of stochastic reserving, only assuming knowledge of basic deterministic reserving. Concepts introduced include parameter and process error, time horizons, current models and bootstrapping. We introduce a new approach for sensitivity analysis - implemented in the R-package SWIM - applicable to complex simulation models, including those used in insurance and financial risk management. In such models, performing sensitivity testing includes stressing the (vector of random) inputs and observing the impact on the output, as well as stressing the output and monitoring the impact on different inputs. Our method is applicable to a single set of simulated scenarios under a baseline model, thus circumventing the need for additional computationally expensive simulation runs. Specifically, we define a stress on an input or output as a reweighting of simulated scenarios, driven by an increase or decrease in risk measures such as VaR and TVaR or in moments such as the mean and standard deviation. The scenario weights are chosen such that, subject to the stress, the Kullback-Leibler divergence is minimised. The SWIM R-package calculates the relevant scenario weights for different stress specifications and generates metrics and plots that allow quantification of the impact of different stresses, as well as importance rankings between different inputs. How sure are you that your reserve models consider the right data and use it effectively? The BSRCH working party will show how statistical engineering approaches with applications from NASA rocket nozzle design to production line continuous improvement can enhance actuarial science. Discussion on Cyber accumualtions for affirmative and non-affirmative including vendor options/in house developments and expierences from company/broker and vendor perspective. Although several practical and theoretical limitations have been highlighted, common reserving practice has been largely based on techniques using aggregated triangles of loss information. Individual claims development models represent a promising alternative, leveraging information embedded in individual claims data and taking advantage of advanced modeling techniques available for larger datasets. This session will review individual claims reserving models from their mathematical foundations to their practical use. Particular focus will be dedicated to the innovation opportunity raised by these alternative methods. Carry out additional analyses, which are viewed as too time consuming to carry out with standard techniques. A key benefit of this hybrid approach is that it remains grounded in traditional approaches – and is therefore readily explainable – whilst also making better use of data science techniques. What is the best segmentation for a reserving project? How can we efficiently identify trends and anomalies in the data that are important for reserving? The data science techniques used in the case studies are feature engineering, clustering and resampling methods. However, the focus of the talk will be on the application of these techniques to answer key reserving questions rather than the techniques themselves. 1. Are we blind (and therefore vulnerable) to claims inflation? 2. What can firms gain from integrating "Claims" with other financial risk control functions? Since the turn of the century, and to a greater degree since the global financial crisis, we have lived in a relatively benign general inflation environment. Beyond some isolated examples, we have also experienced limited claims inflation. Have we become complacent? Have we forgotten how to spot claims inflation? Are our methods, in pricing, reserving and capital modelling able to reflect a changing outlook for claims inflation? As the principal channel for delivering insurance protection, the claims function is the first to experience the effects of emerging trends. Are businesses recognising this in their managment of financial risks? Is there a healthy flow of information and data between key control functions and have other control functions done enough to convince "Claims" to share their knowledge and insights. This session will explore these questions and share our initial findings from discussions with firms, actuaries and claims specialists. The insurance industry is ripe for innovation. InsurTech companies are testing the waters on a host of potential game changers, such as the use of AI and machine learning to develop better pricing models that more accurately quantify risk. The session will focus on risk modeling for cybersecurity exposure. Panelists will discuss the use of data analytics to quantify the impact cybersecurity exposure and will explain how those technologies are used to price insurance products to protect against related risks. Each delegate receives their own unique set of historic loss ratio data, to which they will fit a gamma distribution, both by matching moments and maximum likelihood. Simple goodness of fit tests are applied, and capital requirements calculated at various confidence levels. In the context of the process that generated the data. Delegates will be working on the below excel spreadsheet and are required to bring along their laptops/iPads. G4: Capital Workshop - IFRS 17 Risk Adjustments: Reserving or Capital Modelling? This presentation discusses the difficulties, and proposes solutions that are more familiar to capital modelling specialists than reserving specialists. This provides a cross-over between reserving and capital modelling, narrowing the gap between them. In a time where insurance is becoming more and more data-driven with the advent of “Smart” Insurance, InsurTech, telematics and a push towards automation, actuaries are realizing the need to develop frameworks for more personalized and robust pricing that are adaptive and can deduce hidden patterns in large datasets. Machine Learning and AI can prove to be useful tools here. In this presentation I will start with a very brief overview of the concept of Machine Learning. I will then talk about two prominent models – Extreme Gradient Boosting Machines (and the XGBoost algorithm) and Neural Networks (and Google’s TensorFlow algorithm). I will talk about how these models work, how they deduce hidden patterns in data, and how to tune them to optimize their learning process. I will then present a case study where I train these models on a dataset from R’s insuranceData package and compare them to GLM’s. I will also talk briefly about interpreting ML models and uncovering their black-box nature by using simpler surrogate models combined with techniques from game theory for local interpretation and variable importance and interaction metrics for global interpretation. The presentation will give an insight into the Lloyd’s capital review process last year and the loadings applied by Lloyd’s to syndicates’ submitted SCRs. The reasons behind loadings will be explained and we will talk about some changes to the process in 2019. Through a variety of media (videos, cases studies and interactive role play) there will be the opportunity to discuss some of the issues and problems in maintaining professional standards in today’s commercial world. Papers will be available nearer the time. G4: IFRS 17 Risk Adjustments: Reserving or Capital Modelling?